When Colic Robs You Of What "Should Have Been"
While the crying and sleeplessness were hard, what made that time even harder was that I felt like a complete failure. My first daughter, born 12.5 years ago, had mild colic (if you can ever call colic "mild"). 2.5 years later, my son took colic to a whole new level. To say it was overwhelming and exhausting would be an understatement. My daughter had long bouts of unexplained crying and screaming. Nothing we tried seem to help her, and we felt utterly useless. When our son came along, he pretty much cried and screamed anytime he was awake. I had no idea babies could even cry that much! I mean, what kind of mom doesn't know how to soothe her own child? I guess I had always had this assumption that as long as you fed, changed, held, or rocked your child, he or she would stop crying. I would have tried anything - ANYTHING - that would have promised to help, even a bit. Unfortunately, almost everything I tried seemed to fail. The feelings of failure quickly led to a vicious cycle of guilt, resentment and second-guessing. What did I do to make my child this way? Why can't I have a calm, "easy" baby like everyone else? Why does it feel like everyone else loves having a baby, while I'm barely hanging on? In working with many parents of fussy, colicky and high need babies over the past 10 years, I've come to realize that most of us have these thoughts and feelings somewhere along the way. We are constantly faced with idealized images of what being a new parent is like. We imagine peacefully rocking our baby to sleep, then placing him in his carefully chosen crib. Spending our days at home playing with and caring for our little one, while continuing to do most of the activities we did before. And perhaps most of all, being able to comfort and soothe our baby when she fusses or cries. While these are realities for some parents, this is not everyone's experience. It certainly wasn't mine! All these shoulds are completely understandable. But the problem is they can keep us from seeing our baby and our situation for what it is - not what it should have been. Colic isn't fair. It's not a permanent or life-threatening condition, but it's HARD. Really hard. But what makes it 10x harder is when you're unable to let go of the resentment, the regrets and the "should have beens". 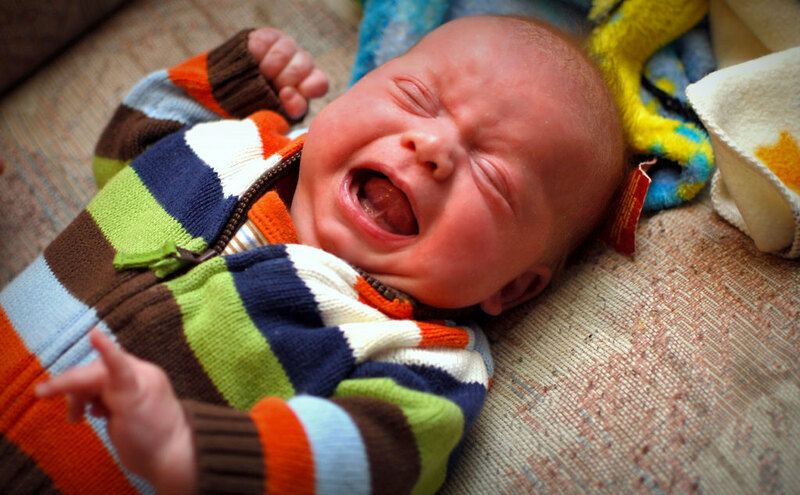 For some parents, the impact of colic can last far past the first 3 months. I find this is particularly true for parents who were never able to let go of the "shoulds". Letting go of what you thought parenthood would be like isn't easy. There's usually some grief that happens, as you realize you may never get to have that calm, sleepy newborn everyone else seems to have. But don't let colic win. Don't let it rob you of enjoying the special moments you do have with your child. Don't let it convince you you're a bad parent, or that someone else could do it better than you. And while you're in the middle of it, try to go easy on yourself. Remember that your ability to soothe your child isn't a valid representation of what kind of parent you are. If you could ask your baby why she's crying so much, probably even she wouldn't know - so how could you possibly be expected to? Ask for help, and surround yourself with people who understand. Don't assume you should be able to do it all, just because you're the parent. And most of all, love your baby. Hold him, rock him, bounce him on an exercise ball - whatever it takes. Let everything else go for now, and make getting through this time your priority. It won't be long until you have that peaceful, smiling baby and these difficult days are a thing of the past. Holly Klaassen is the founder of The Fussy Baby Site, a support site for parents of fussy, colicky and high need infants and toddlers. She's also the author of the free eBook, 5 Things I Wish I Had Known About Colic. She wants you to know that if you have a colicky baby, it's not your fault and you're not alone!